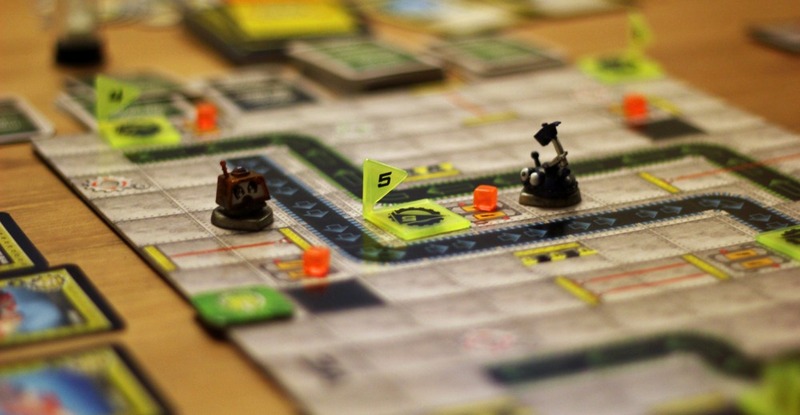 RoboRally, SU&SD Recommends, New to Games? 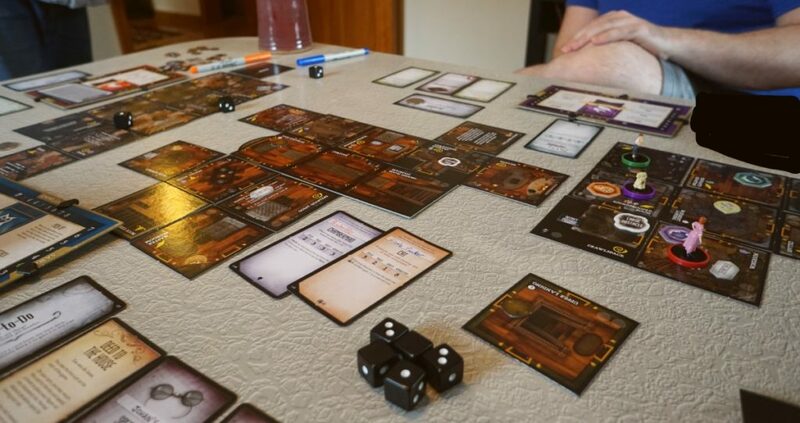 Pip: When living with a fellow board game enthusiast you have the benefit of a ready-made companion for cardboard adventures – HOORAY! – but you also start to realise that, for a lot of games that say they’re for 2-to-however-many-players on the side, there’s this disproportionately large leap in enjoyment between the two-player version and the three-or-more-player outings. Robo Rally might be the ultimate illustration of this. With three people it’s a rambunctious clusterpickle of robots and conflicting agendas where your neatly programmed sequence of moves gets nudged hilariously and disastrously off course. With two we ended up trying to house-rule it so we could ginger up the experience and keep our momentum. 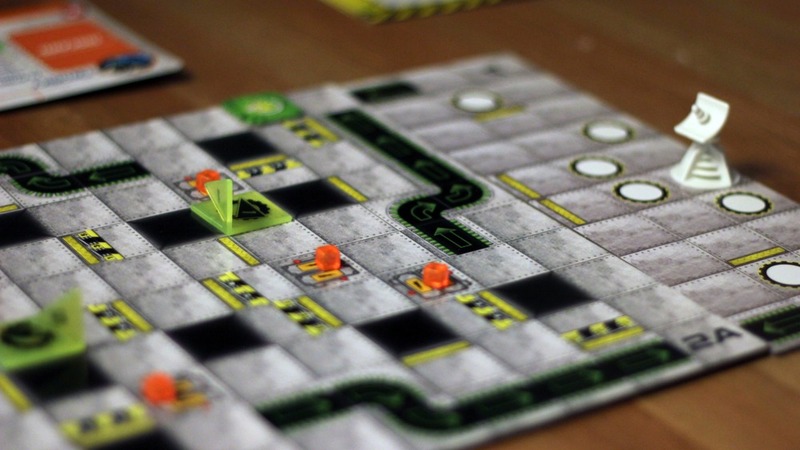 Quinns informs me that SU&SD is all about reviewing board games in their favoured conditions, though, so consider this a review of Robo Rally the beloved 3-6 player omnishambles, and not Robo Rally the 2 player compromise-simulator. SO! 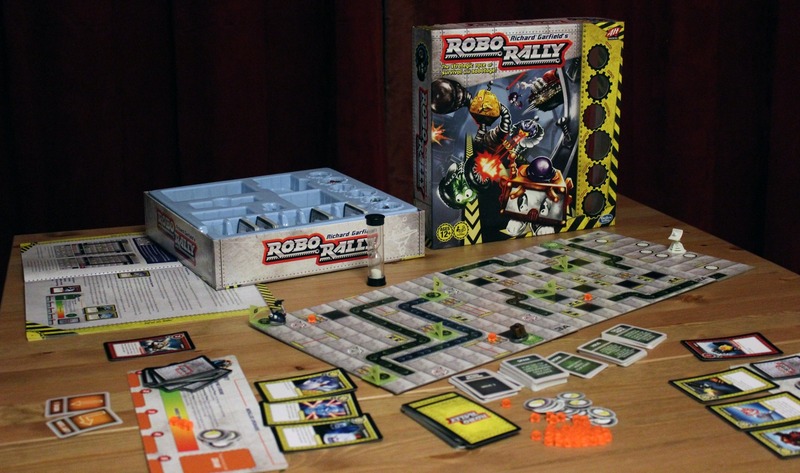 Robo Rally is a classic game about programming a tiny robot so that it races around the board, arriving at numbered checkpoints. The programming is done by placing cards that describe particular moves (left turn, right turn, moving forward a certain number of squares, pausing to earn an energy cube…) into the spaces on your player sheet before executing them. With luck and skill this will coax your little robo-friend towards the finish line, and – in an ideal world – not careening into a bin. Obstacles in Robo Rally include conveyor belts, pits, lasers, weapons fired by other robots, your own inability to remember left from right under pressure, and the fact you can be shoved entirely off course by one of the other bumbling bots. 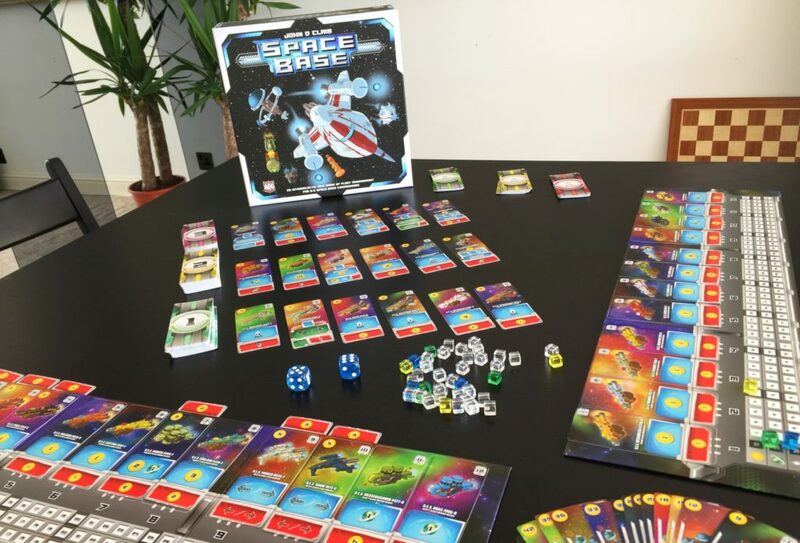 The new 2016 version also sees the game’s original designer, Richard Garfield (the industry legend behind Magic: The Gathering, Netrunner and King of Tokyo), comprehensively updating the game for the 21st century. So while the new Avalon Hill version which I’m reviewing still lacks the variety and expensive components of Quinns’ beloved original game, it’s also the superior design. 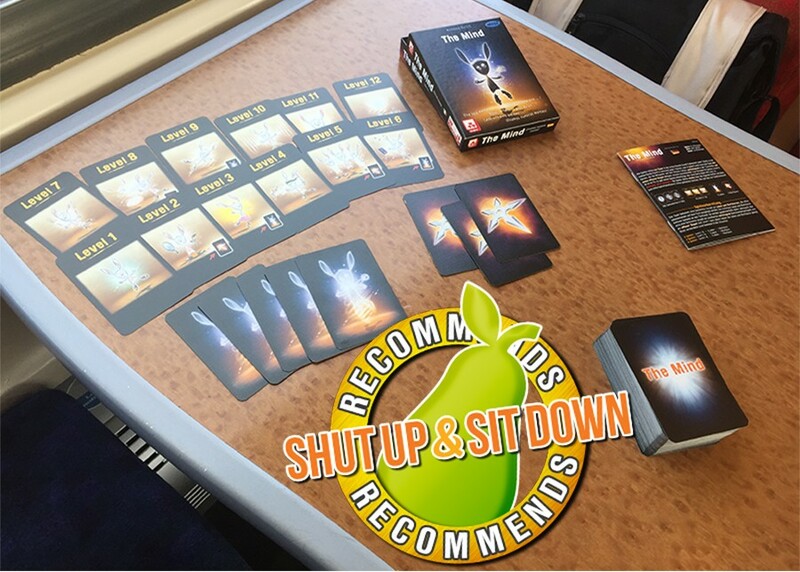 Each player now has their own set of movement cards, making the hand you’re dealt a bit less unpredictable, while a fixed shopping phase each turn now lets everyone play with the deck of temporary and permanent upgrades. In the original game these Option cards were the domain of anyone who’d rather make a pit stop than actually, y’know, race. So we’ve got a smoother game, but certainly not a simpler one. 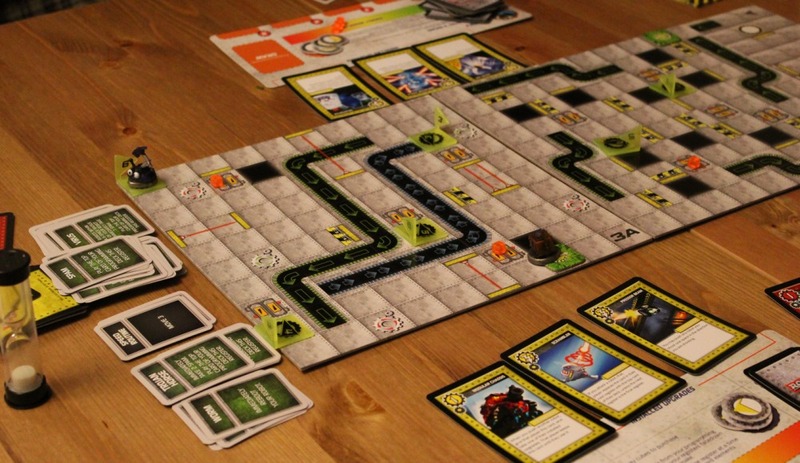 It actually took a little while for me to get to grips with the rhythm of play because there’s a lot to cycle through each turn and it’s easy to get tripped up by some of the ideas. For example, you need to constantly recalculate player priority. Obviously I feel that I should ALWAYS be given priority but what this means in Robo Rally is that the player order for each part of the game isn’t fixed but is determined by how close you are to a thing called a priority antenna. Player order is really important for a number of reasons – if you’re first you get first pick of the shop cards, and if you’re the person who lands on a pit stop first you get to pick up the energy cube it’s stocked with. It also affects how you move around because if you’re moving first, later players might barge into you, rather than you getting to barge into them and that will affect the rest of the movements you’ve put into your sequence because they will now be TERRIBLE and WRONG and OH GOD YOU ARE GOING TO END UP IN A PIT. Then again, if you go first you might put yourself next to a wall and make yourself into an ingenious, un-shoveable obstacle (albeit one getting raked with lasers in a cross between a traffic jam and a disco). 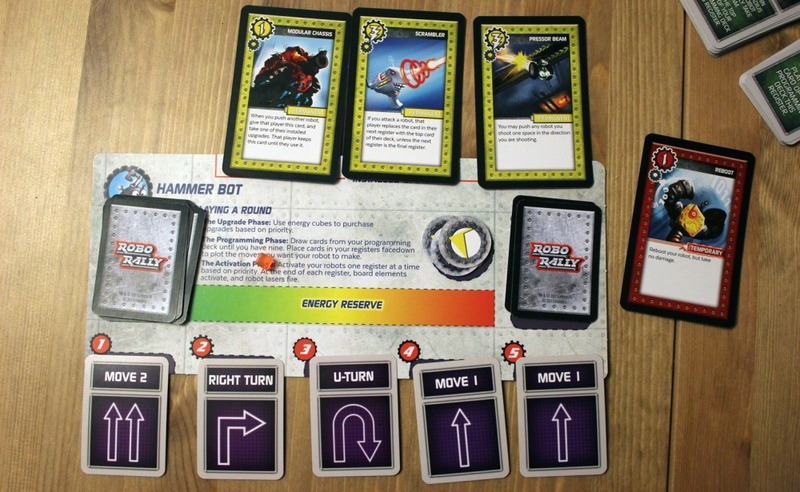 I can see why you want elements to activate in the same order each time, because it means you can do some delightfully sneaky strategising, hopefully setting up some kind of card-bot Rube Goldberg chain of events that gets you to a checkpoint, or predicting where someone else will be during a turn so you can reverse your little robot into them and knock them off the board (BEEP, BEEP, BEEP!). But I think it’s a bit of a missed opportunity to not have that order of events on a chunky bit of card you can stand up next to the board for easy reference. For a game where so much of the thrill is in silly schadenfreude, the last thing you want is players picking through rules like a tangle of cables. Speaking of pain, with this new edition Robo Rally’s aged damage system has been replaced by something much more fresh. 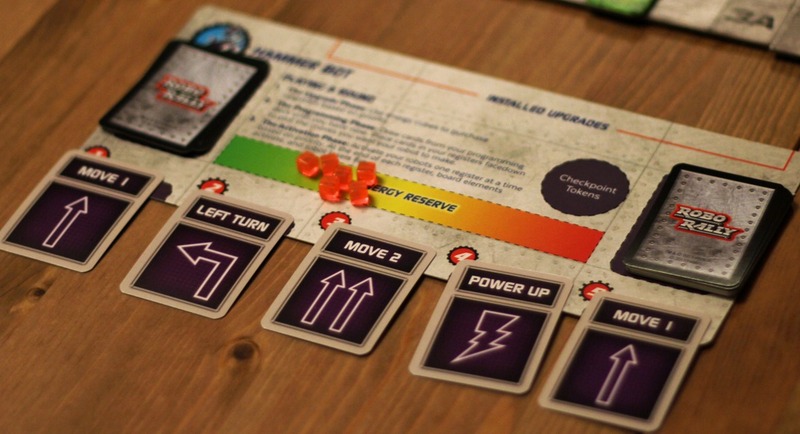 Pushing other people off the board, shooting them with your lasers, pushing them into someone else’s laser, upgrading your own lasers to do terrible things and so on no longer cripples your opponents until they’re sloping around the board like weighted Roombas. Instead damage means accumulating cards related to computer problems. Spam is the most common but Trojan horses, worms and viruses can also crop up. What these do is neat because they go into your deck of movement options and gradually start to clog it up with nasty surprises. That was a fun idea in Colt Express, and it’s even more fun here because the damage cards aren’t simply blank. Instead, they have unpredictable effects if you program them. Sometimes this works out brilliantly as I found when I needed a right turn to stay in the running for a checkpoint. I didn’t get one in my hand for that round but I hadn’t seen one in the deck for a while so I played a spam card into the relevant slot and crossed my fingers that a glut of them were about to appear in the deck. My reward was a right turn! Sometimes it works out absolutely terribly and you end up falling into the aforementioned pit which not only cancels the rest of your moves and sends you to a miserable reboot square on the map to think about how sad you are, but it ALSO forces you to pick up some more spam cards so you’ve managed a net loss on that front too. DISASTER. And so! With three or more people you seem to achieve a really satisfyingly chaotic level of interactivity on the boards, even if you choose one of the really basic setups. There’s a lot of bashing into one another and a lot of comedic confusion as people nosedive into laser grids by accident or suddenly realise that in the haste to jam cards into a slot before the sand timer runs out they’ve played a move backwards card instead of a move forwards card and they sail into the robo-bin, bum first. Just like with Galaxy Trucker, the alchemy of this game is in transmuting pain into laughter. “Oh no, I meant my other left,” cries a player, holding their head in their hands as this game of meticulous programming turns into a spectator sport, and they watch their precious robot go trundling off on its own initiative. Meanwhile everyone else laughs with relief, because this can and will happen to them later on. As to the player count, I think it’s to do with the critical mass of robots bimbling around – they can’t seem to help hitting each other early on and that immediately lets you start ramping up the damage. More damage leads to more spam which leads to more chaos and thus more damage. With two you seem to fall below that threshold and it’s far harder for the loop to establish itself and thus you can end up in games which feel far more like a logic puzzle or a slow-moving, non-chaotic affair. They can be interesting in their own right if you enjoy logic puzzles, but they’re a lot less energetic and can be flat-out dull. On that front there are 19 different courses given in the rulebook of varying difficulties and game length. We graduated up the difficulty curve pretty quickly as we sought out levels to get our teeth into, but I’d be grateful for the lower, quicker levels if I were teaching it to a young relative, or perhaps someone who doesn’t habitually play this kind of game. I also want to make sure I mention the pieces before I wrap up. The robots themselves are adorable and full of personality, and the energy cubes are very small and I found them fiddly but they’re that pleasing kind of translucent orange plastic that looks almost edible (DO NOT EAT THEM). The bits I didn’t like were the player cards and the checkpoint markers you collect. The former are thin card and just felt a bit cheap, although not offensively so. The latter are these really thin cardboard discs there the cheap feeling did chafe because they felt so inconsequential even though they’re the key marker of your progress. I imagine most people will find their own markers and sneak them in instead. The movement cards also seemed peculiarly small. I wasn’t super bothered by it, but given you have to pick them up and shuffle them so many times your hands are definitely aware that they’re a bit too small for comfort. Which is a slightly disappointing end to a review of a game that gets so much right. Pip: OH MY GOD, where did you come from?! You said I’d be doing this review myself. Quinns: I’m sorry, I couldn’t help myself. I’m just so tired of these halfway houses. When are we going to get the definitive edition of Robo Rally, eh? This clearly comes a long way, but why is everything so small and thin! 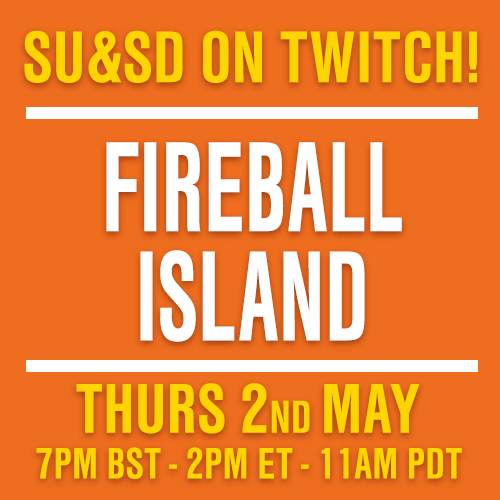 Quinns: And then Wizards of the Coast could bring back some of the EXPANSIONS FOR IT! Pip, you’re a genius. Pip: Do you really think it needs an expansion? Quinns: I’m going to pretend I didn’t hear that.